Hailing from Shipputsuki, Ayame is fairly typical. With long brunette hair usually worn in a ponytail, she is rather non-imposing due to her small stature and slender frame, much like the delicate flower she is named for. While slender, her limbs are rather well-toned due to her intense training held at the the shrine she lives within the confines of. Her eyes are a soft hazelnut shade, which complements her warm facial features. 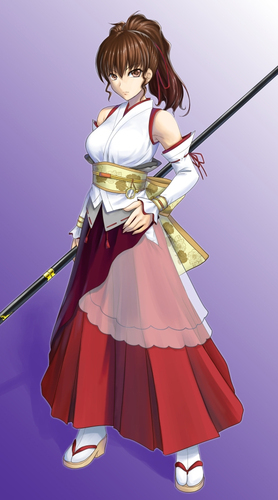 Ayame typically wears light colored and and loose garments such as the sleeveless white uwagi and red andon bakama which she wears when serving at her shrine. She is also fond of ankle-length skirts and loose robes. She typically wears a flower in her hair where her ponytail is knotted. Ayame has something of a dual personality. Despite being a extremely intelligent and kind-natured girl, Ayame is at times a very whimsical and scatterbrained youth, lost in the ebb and flow of things. Frequently aloof with her head seemingly in the clouds, there is a sharp intellect and wisdom behind those often vacant eyes. Other times, she is a pragmatic and analytical martial artist with clear focus. Some would consider it one of life's great mysteries how Ayame's mind works. Level 1 - Combat Expertise: Fight defensively for a +1 dodge bonus to AC at the cost of -1 to hit. At +4, +8, +12, +16, and +20 BAB the benefit and penalty increases by 1 each. Improved Unarmed Strike: Lethal damage while unarmed. Archtype: Monk (Weapon Adept). Gives up stunning fist (1st), evasion (2nd), improved evasion (9th), timeless body (17th), perfect self (20th) in exchange for Perfect Strike (1st), Way of the Weapon Master (2nd), Evasion (9th), Uncanny Initiative (17th), and Pure Power (20th). Archtype: Monk (Qinggong Monk). Can give up any of the following abilities for a Ki power: slow fall (4th), high jump (5th), wholeness of body (7th), diamond body (11th), abundant step (12th), diamond soul (13th), quivering palm (15th), tongue of the sun and moon (17th), and empty body (19th). Perfect Strike (Ex): At 1st level, a Weapon Adept gains Perfect Strike as a bonus feat, even if he does not meet the prerequisites. At 10th level, the monk can roll his attack roll three times and take the higher result. If one of these rolls is a critical threat, he can choose which one of his other two rolls to use as his confirmation roll. Unarmed Strike (1d6): At 1st level, a monk gains Improved Unarmed Strike as a bonus feat. A monk's attacks may be with fist, elbows, knees, and feet. This means that a monk may make unarmed strikes with his hands full. There is no such thing as an off-hand attack for a monk striking unarmed. A monk may thus apply his full Strength bonus on damage rolls for all his unarmed strikes. Usually a monk's unarmed strikes deal lethal damage, but he can choose to deal nonlethal damage instead with no penalty on his attack roll. He has the same choice to deal lethal or nonlethal damage while grappling. A monk's unarmed strike is treated as both a manufactured weapon and a natural weapon for the purpose of spells and effects that enhance or improve either manufactured weapons or natural weapons. A monk also deals more damage with his unarmed strikes than a normal person would. AC Bonus (Ex): When unarmored and unencumbered, the monk adds his Wisdom bonus (if any) to his AC and his CMD. Works flat-footed and vs. touch attacks. Only works unarmored.. Flurry of Blows (Ex) (–1/–1): Can perform a full-round action to attack multiple times with unarmed attacks or special monk weapons. Monk 1st Level Bonus feat: Deflect Arrows. Dual Talent: Some humans are uniquely skilled at maximizing their natural gifts. These humans pick two ability scores and gain a +2 racial bonus in each of those scores. This racial trait replaces the +2 bonus to any one ability score and the bonus feat. Fearless: Humans tend to be stubborn and arrogant, shirking caution when other races might heed such. They gain a +2 bonus to all saving throws against fear effects. Head Flower An ordinary Iris is woven into Ayame's hair. Torso Monk's Garb Ordinary, non-magical. 1 Exorcism Staff Ceremonial staff, can be used as a quarterstaff. 4 lbs. 1 Monk's Outfit Clothing worn. Loose top and skirt held together with sashes. 2 lbs. 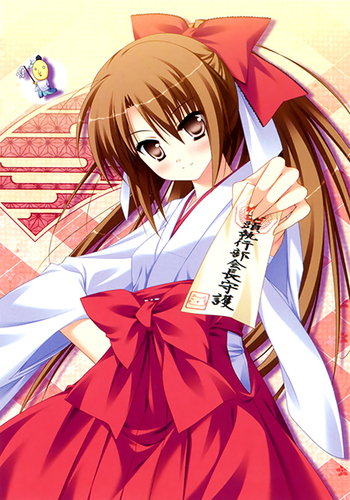 Character History or Personality information: Ayame is a Miko and granddaughter to the keeper of the Tsukoshima shrine in the village of Okinoka. There, she looks after the kami enshrined there, a vengeful water spirit that once kept the streams in Okinoka from allowing the people there to prosper. Due to her pretty face and pleasant demeanor, Ayame was given the role of selling good luck charms at her shrine to the visitors. At a young age, Ayame's parents were killed in a struggle to re-seal Nigisukesumi, the kami of the shrine who had been released. Her grandfather, Akatake Yojiro, elected to train Ayame as the remaining heir to the shrine. Her spiritual and martial training were to be essential should the need to re-seal Nigisukesumi ever arise again. Yojiro was a well versed martial artist and exorcist, and taught Ayame how to wield her exorcist's ceremonial staff as a weapon in the event of emergency, as well how to fight bare-handed. Training in the reeds and grass near her shrine was a common event for her, along with sensei Akatake's other students. As a spiritual medium, she was tasked as a coming of age ceremony to meditate and communicate with the spirits of the dead and kami, and embark on a quest to do a miraculous good. Only upon achieving this high expectation should she return to the shrine to become a suitable heir to her grandfather's shrine. Meditating within the shrine, Ayame glimpsed a vision of a massive city divided by a flowing river. Seeking this place, she arrived in Arae`Saena.